October 2014 - Lochearn Summer Camp for Girls - Our Girls Sleepaway Camp Blog! We are so excited and honored to announce the new members of the Five Year Club! Upon their induction, the Five Year Club celebrated with an ice cream and mini-golf trip. Thank you for being a part of Lochearn each summer! Additionally we would like to congratulate all Activity, LC and Spirit Cup award winners on their achievements this summer! Congratulations to the Blue Team! On Banquet night of Session 2 the Blue Team Captain and Cheerleader accepted the plaque on behalf of the team, as the Blue/Green competition winners of Summer 2014. Each team sang their banquet songs in anticipation of the announcement. 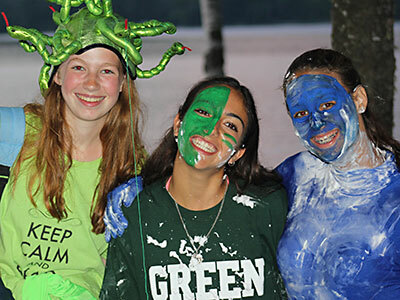 Both Green Team and Blue Team rocked the competition throughout the summer – dressing up in festive attire, cheering on their teammates and putting everything they had into the games. It wouldn’t be Lochearn without Blue and Green! For a full list of all 2014 Five Year Club Inductees and Activity, LC and Spirit Award winners please check out the most current issue of The Bagpipe. This entry was posted in Camp News, Uncategorized and tagged camp for girls, Camp Lochearn, girls camp, girls summer camp, vermont camp on October 28, 2014 by Lochearn Admin. We can’t wait to make more great memories in 2015! This entry was posted in Camp News, Uncategorized and tagged camp for girls, Camp Lochearn, girls camp, girls summer camp, vermont camp on October 21, 2014 by Lochearn Admin. As we settle into our routines of fall – school books, year-round sports, cooler weather – Summer Camp 2014 has become a not-so-distant memory. WOW! What a summer! We know that all of our girls begin the fall as different young ladies than they were at the beginning of the summer. Maybe they have gained confidence from climbing the Alpine Tower, learning to wakeboard, or learning to trot on a horse while posting. Some of them made new friends and gained a sense of accomplishment by taking care of their cabins and themselves for four weeks. Some Lassies came back to school with new songs in their hearts, and memories of Scout on the paddleboard, and Sadie fishing. Not sure who is missing CAMP more: the campers, the counselors, or Scout and Sadie. We definitely are missing all of you and wish you a wonderful and successful school year! With the help of all the campers and counselors, Lochearn found the FUN this summer. We enjoyed every AMAZING DAY IN THE BEAUTIFUL STATE OF VERMONT! The arts, waterfront, and sports fields helped shape our Lassies into greater athletes, stronger leaders, and kinder friends. We know that Camp friendships are the ones that last and sustain us throughout the years. We want to thank all of you for being part of the 2014 Lochearn experience, and can’t wait to see you in 2015! This entry was posted in Camp News and tagged camp for girls, Camp Lochearn, girls camp, girls summer camp, vermont camp on October 16, 2014 by Lochearn Admin. 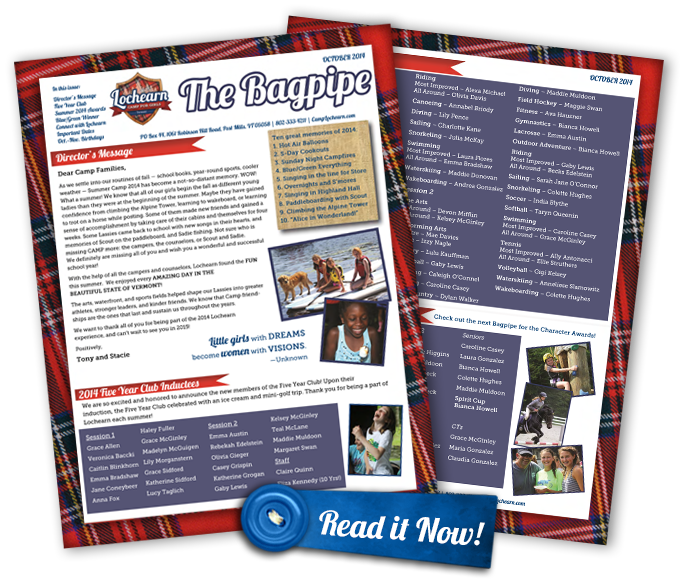 The Latest Edition of the Bagpipe is Out! Click here to enjoy the latest edition of the Lochearn Bagpipe! Learn more about Blue/Green winners, and program area awards. Great photos and important dates. Enjoy! This entry was posted in Newsletter and tagged Camp Lochearn on October 9, 2014 by Lochearn Admin.